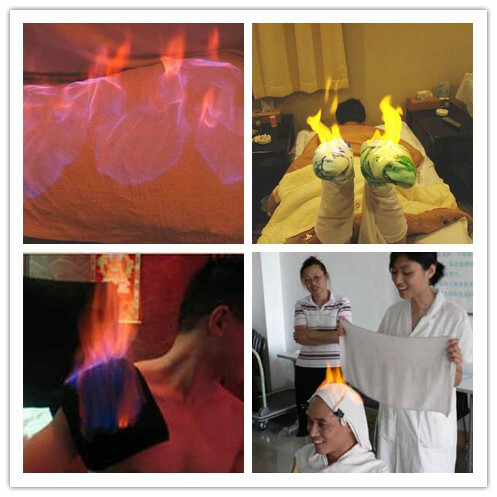 The antients could alleviate pain getting burned when heating foods, so they get themselves more burning on body initiatively for pain killing, and this is the origin of the Huo liao. The earliest work recorded is “wu shi er bing fang” and “yin yang shi yi mai jiu jing”. Huo liao was originated from acupuncture and moxibustion while different from which pain and people feel more relaxed and comfortable through Huo liao. It combines meridians theories from moxibustion and also plaster therapy from acupuncture therefore the drug effect is enhanced. This is a method that can swiftly open up the pores and meridians with fire burning right on the surface of skin making a totally free body and balance in yin and yang. In ancient times, people live outside and when it’s getting cold， they rub and press on hands so that they accelerate body circulation, prevent coldness and enhance the cold-resistant ability. When the body getting uncomfortable or painful, they would message the point for alleviation and improve physiological functions of zang fu organs, tissues and body organs for all. Reasons: head pain causes can be a lot, which can be classified into exogenous and internal one, and have certain relations with emotional factors that influence people's work, study and life. External factors – Due to carelessness in daily life, one could be exposed to the cold, heat or wind pathological factors, making the head painful and meridians blocked which leads to swelling head pain. Pent up liver – Things and people that one are not going well could lead to liver pain, and the pent effect the upper body, head for example. There comes the second reason of swelling head. Nervous and overworked--Due to the fast pace of work, tight nerve, psychological pressure, or continuous work, excessive use of the brain, the head can not take more, leaving tight meridians, disorders of Qi and blood and eventually the swelling head pain. Billions of cells in human brain that only 1%-1.5% of them are involved in neural function activities. Backed with anagenetic ability of central nerve system, oxygen lack and metabolism disorders can be ameliorated by Chinese Huo liao therapies, so that regeneration re-functioning of remained neures are possible. Fire Therapy Treatment - The Most Amazing Heat Therapy for all your legs problems!